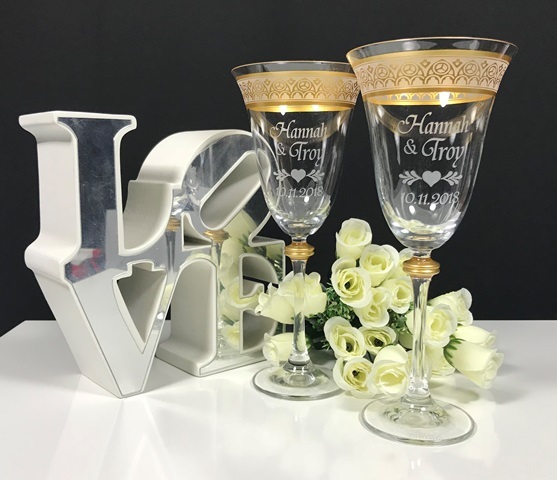 The Bohemia Wine Goblets, makes a great gift to any bridal couple or someone celebrating an anniversary. 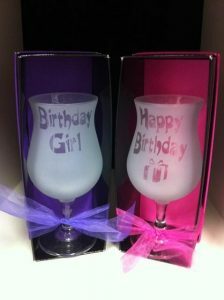 These gorgeous wine glasses are universal and can be used for either red or white wine. A capacity of 425mls. Select your font and design style. These glasses come gift packed in white gift box. An art proof will be supplied before production commences for you to see how your design will look prior to manufacture. Our Bohemia Wine Globlets comes safely packaged in a White Box with white satin lining. 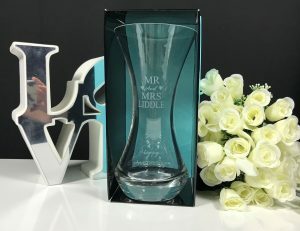 You can choose for your glasses to be etched or with gold, lettering and these options can be chosen from the drop down menu. The glasses measure approximately 224mm in height and holding 425mls of wine. 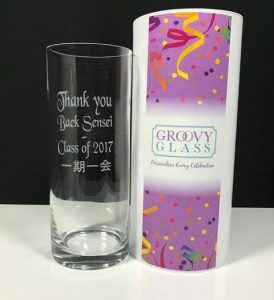 Pricing includes the pair of glasses using any of the fonts and graphics. Select your graphic and font and you have played a part in the design process. Once your order is received we will provide a detailed art proof for you to approve. Please allow 7 business days once approval has been received for production to be completed.